What Day Of The Week Was November 17, 1939? 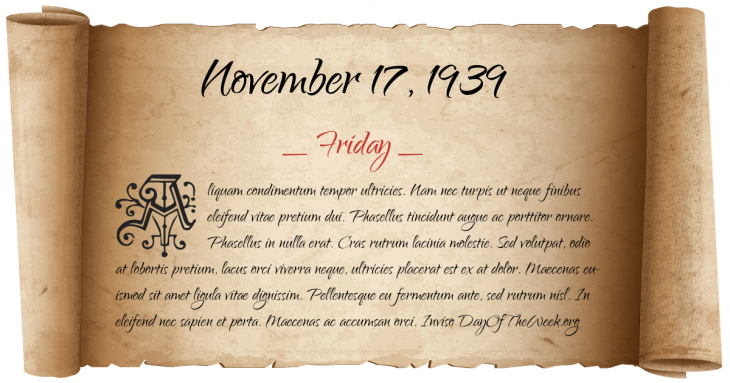 November 17, 1939 was the 321st day of the year 1939 in the Gregorian calendar. There were 44 days remaining until the end of the year. The day of the week was Friday. A person born on this day will be 79 years old today. If that same person saved a Quarter every day starting at age 6, then by now that person has accumulated $6,705.25 today. Here’s the November 1939 calendar. You can also browse the full year monthly 1939 calendar. Nine Czech students are executed as a response to anti-Nazi demonstrations prompted by the death of Jan Opletal. In addition, all Czech universities are shut down and over 1200 Czech students sent to concentration camps. Since this event, International Students’ Day is celebrated in many countries, especially in the Czech Republic. Who was born on November 17, 1939?